In Jesus Calling, author, Sarah Young, says, “Thanking Me for trials will feel awkward and contrived at first. But if you persist, your thankful words, prayed in faith, will eventually make a difference in your heart. Thankfulness awakens you to My Presence, which overshadows all your problems.” I want to say it also enables us to get up and face one more day giving us a new perspective in our circumstances. Did you catch the lyrics…there will be a day with no more suffering and no more tears – but until that day we hold on to Jesus! 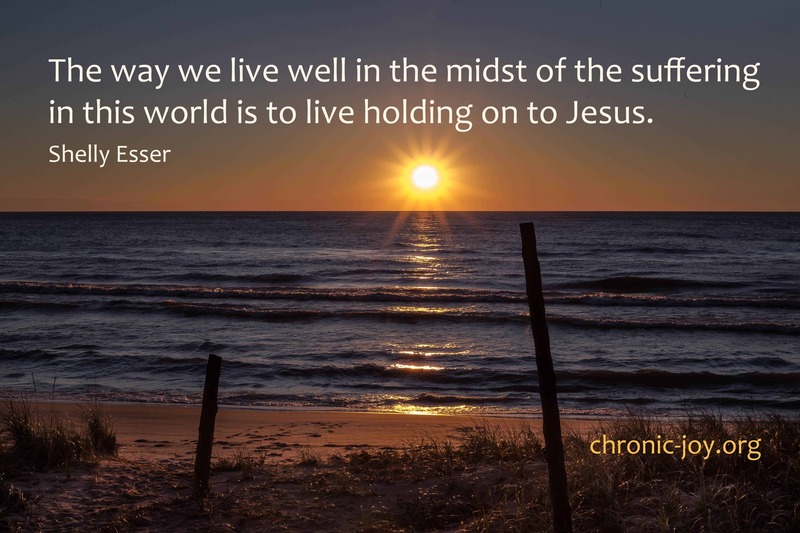 The way we live well in the midst of the suffering in this world is to live holding on to Jesus. Knowing that whatever comes our way, He will always be right by our side walking us through, holding us up, and giving us the supernatural strength, grace, and hope to walk through whatever we’re facing. God is never closer than when our hearts are breaking. Eventually He will wipe away all of our tears. Until then, not one will go unnoticed, not one will be ignored. And Revelation 21:4 reminds us that not only will He wipe away our tears, He’ll remove all the sorrow that caused them in the first place. Thank you for sharing this beautiful post. These thoughts are so helpful when I want to walk as Jesus directs through these days: to stay Thankful and to stay Hopeful–and to keep my eyes open and my heart praying for those around me who are also in hard situations. –Blessings to you!